Once or twice a year nervous secretaries gingerly hand me an unexpected envelope, the contents often swathed in bubble wrap or, occasionally and rather beautifully, squashed flat with by a Post Office franking machine with a precision that the most perfectionist Victorian naturalist would admire. I look forward to these letters asking for an identification of the creature enclosed. My favourite was the Great Diving Beetle letter. 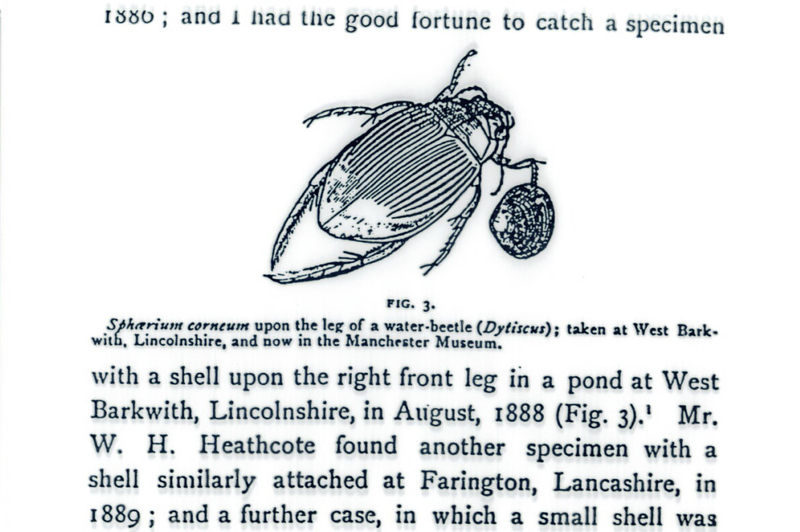 The beetle, a species of Dytiscus, 3cm of clockwork black and yellow mechanical precision, had crash landed on a snooker table in garage, mid game. The sender was worried that this intimidating creature was woodworm; we were able to provide re-assurance. 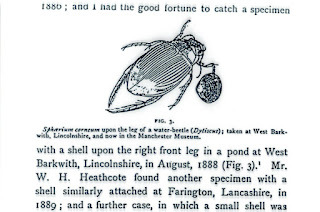 Great Diving beetles can fly well and, like many pond creatures, their mobility is a way of finding new homes and surviving tough times. Other pond life cannot fly but can cadge a lift. The illustration above comes from Kew's 1893 book The Dispersal of Shells. Clamped around the hand front leg of the Diving Beetle is a pea mussel, a small clam, the two valves of its shell holding firm, possibly enough to be taken on a flight by the beetle. Beetles, bugs and birds make good vectors for moving smaller wildlife from pond to pond. Charles Darwin famously wrote of his experiment dunking the feet of a stuffed duck into an aquarium to see what little creatures might attach to this potential lift. Tricky to do with birds in the wild but next time you are checking the ducks, geese and herons pottering in the shallows you are watching an arrivals and departures terminal to rival any airport.